Use case: Having a wiki with multiple blogs, someone might want to display some info/panel from a certain blog in a location that's not related to a blog. 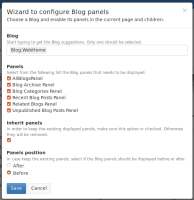 The plan is to improve the Blog panels to use a variable representing the name of a blog and to add an UI Extension in the More Actions menu that will open a modal window with a configuration form that will update/create the .WebPreferences page with the new panels defined in the right panels section. This can't be done with Configurable Class because it doesn't support page level configurations. 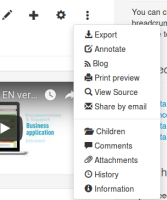 As a consequence I'm proposing to add a new menu item while waiting for the feature to be present, see XWIKI-15564. When that is fixed, we can implement the BLOG-116 to move the configuration in the Page Administration.